I'm probably as much at sea as you when it comes to the Academy Awards for Art Direction, Cinematography & Sound. For instance, I just now found out that these, technically, aren't the "technical awards." No, those are goverend under the Academy's Rule 18, and are lumped together as "scientific and technical achievements." Also, it appears, there may not be any if the Committee decides there have been no "devices, methods, formulas, discoveries or inventions of special and outstanding value to the arts and sciences of motion pictures" during the year being considered. Well. Learn something new every day. Guess I'll have to stop calling these the "technical awards," and go back to calling them the "awards nobody but the crew cares about." Oh yeah, nobody but the crew... and those of you who want to win your Oscars Pool. Art Direction Nominees: Good Night, and Good Luck, Harry Potter and the Goblet of Fire, King Kong, Memoirs of a Geisha and Pride and Prejudice. Cinematography Nominees: Batman Begins, Brokeback Mountain, Good Night, and Good Luck, Memoirs of a Geisha and The New World. Who should win: I'm lumping these together because A: It's 12:30 am and I'm tired, and B: I think both of these races are between the same two films, Good Night, and Good Luck and Memoirs of a Geisha. It actually pisses me off that there should be a question in anybody's mind as to which film should win these awards: Good Night, and Good Luck was in black and white, for chrissakes! Do you know how hard it is to shoot in black and white? Or prepare sets, costumes and props so they show up in the right shade of grey? Neither do I, but I imagine it's pretty hard since we (most of us) see in color and can tell the difference between screaming yellow and a really bright white. 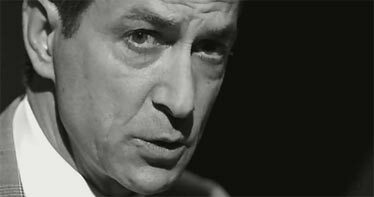 Good Night, and Good Luck got the period right (art direction) and looked gorgeous frame after frame (cinematography). It received the Los Angeles Film Critics' Association's award for best cinematography and today's -- Saturday's -- Independent Spirit Award, and was nominated for an ASC award (American Society of Cinematographers) and an ADG award (Art Director's Guild). Who will win: Guess which film won both the ASC and ADG awards? 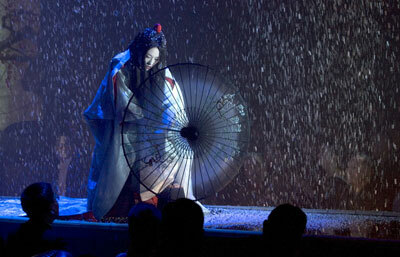 Memoirs of a Geisha, and like I said, it really pisses me off since I am not a fan of this movie. But that's for the director's choices, not because of its cinematography or art direction. I just think that Memoirs is more of a costume drama than an achievement in these two categories. It speaks to our stereotypes -- falling cherry blossoms, girls mincing in geta, drunken businessmen patting their assets -- and it's lone, spectacular scene (the dance, pictured) isn't particularly innovative, and it's spectacular for its editing and choreography. Hrmph. I'm so worked up I can't think along the lines of "Who was robbed" now. Except maybe Good Night, and Good Luck. Who should win: Ok, I know these two categories don't have the same potential winners, but I'm still tired so we're going for the gold. I'm pretty sure that Mrs. Henderson Presents and Pride and Prejudice are out of the running in best costume category, if only because neither were nominated at the Costume Designers Guild Awards. Charlie and the Chocolate Factory was nominated in the Fantasy Costumes category and lost; Walk the Line and Memoirs were both nominated in the Period Costumes category, and guess which flick won? Finally, a category where I don't mind if Memoirs of a Geisha wins, even if my brother did work on the film Walk the Line. And when it comes to best makeup, I don't think the Academy will be choosing bruises over beasts or creatures, so that leaves out Cinderella Man. 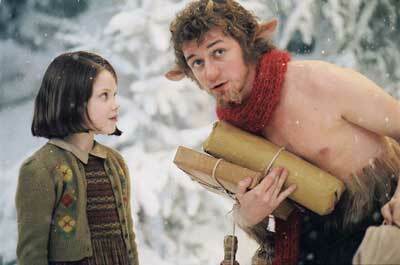 I thought the beasts in The Chronicles of Narnia were more spectacular than the sad Sith. So sue me. Who will win: If the voters are especially glad -- like me! -- to see the end of the Star Wars Saga mercifully put out of its misery, then this is their only chance to give George Lucas a statuette this year. My bet is on Star Wars III taking home the makeup award. 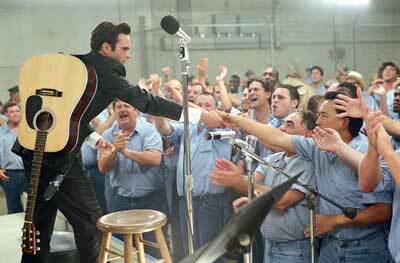 I think Memoirs will also grab the costume award, since it was able to muscle over Walk the Line in the Guild award. How sad is it that Memoirs of a Geisha may take home more Oscars than Brokeback Mountain? I'm crying over here. Film Editing Nominees: Cinderella Man, The Constant Gardener, Crash, Munich and Walk the Line. Who will win: That's right, I'm cutting right to the jugular on these last awards, since I know as much about film editing as I do about sound mixing. Cinderella Man is the only one of these films not to have been nominated for an ACE Award (Association of Cinema Editors), while Walk the Line won. I figure the experts must know, and the voters must know that the experts must know. You know? Sound Mixing Nominees: The Chronicles of Narnia: The Lion, the Witch and the Wardrobe, King Kong, Memoirs of a Geisha, Walk the Line and War of the Worlds. Visual Effects Nominees: The Crhonicles of Narnia: The Lion, the Witch and the Wardrobe, King Kong and War of the Worlds. Who will win: These are tricky. I don't really know the difference between sound editing and mixing, and I couldn't find any guild awards for sound mixing. Meanwhile the Motion Picture Sound Editor Awards were just given out Saturday and I haven't been able to learn who won, although all of the films were nominated in some category or other. I can tell you that Walk the Line won the Cinema Audio Society Award for sound mixing. But the editing is anybody's guess. Will the Academy want to give it to the team from Down Under, even though Peter Jackson just took home a pile of trophies a mere two years ago? Or will they want to compensate Steven Speilberg for the thrasing -- and trashin -- Munich is receiving by rewarding him for War of the Worlds? I'm going to step out onto a shaky, slender limb and say that these two will cancel each other out and Memoirs of a Geisha is going to sneak in there and grab another award. Choke. Meanwhile, whither goest Sound Editing, goest thou, Visual Effects? You'd think that, with almost the same three nominees it would be true, but -- except for the years where a Lord of the Rings movie was nominated in both categories -- a scan of recent years' recipients doesn't prove this to be true. I think the spectacle of the giant Kong interacting with Naomi Watts is going to win out over the spectacle of Tom Cruise reacting to a green screen. 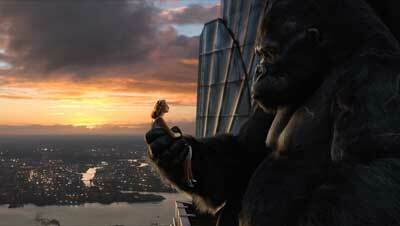 I pick King Kong. Sorry, Steven. I can't believe I've reached the last category ... and managed to handicap all of the Oscar races. I hope you had as much fun as I did. And that you're getting more sleep. I'll be back one last time with a wrap-up, and we'll look at my scorecard and see how I did. Now aren't you glad that your predictions in the major awards don't have to be out there for the world to laugh at? Enjoy the show! Good Night, and Good Luck still courtesy Warner Independent; Memoirs of a Geisha still courtesy of Columbia Pictures; Chronicles of Narnia still courtesy of Walt Disney Pictures; Walk the Line still courtesy of 20th Century Fox; King Kong still courtesy of Universal Pictures.